On the occasion of celebration of 100 years of Norwegian-French educational cooperation, yesterday, on September 24, 2018, Queen Sonja visited Pierre Corneille high school in Rouen, France. 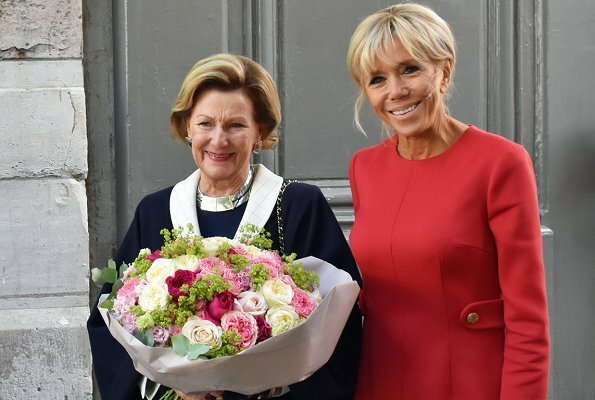 Queen Sonja of Norway met with former and current pupils in a conversation together with French first lady Brigitte Macron and Norwegian ambassador to France Rolf Einar Fife. 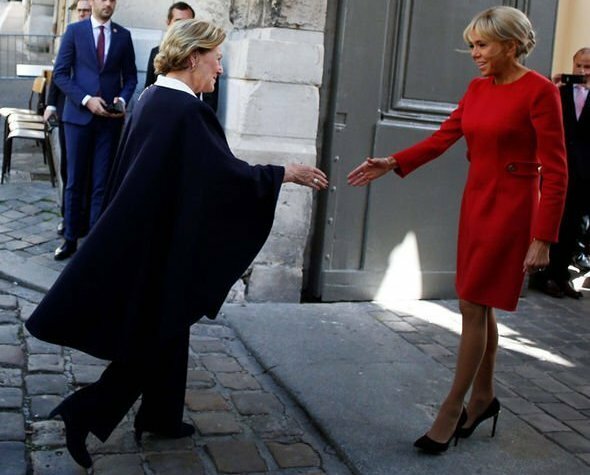 Queen Sonja and Brigitte Macron attended an outdoor ceremony at the school and a luncheon at Rouen City Hall. To ensure an educational cooperation and to establish of a Norwegian section at the school were part of a peace-building measure at the end of World War I.
Sonja, always classy! Brigitte's dress length is much better here than usual and I like this dress on her. Yes, the length of Mme Macrons dress is much better. But with her fake tan and her fake hair she still is far from elegance. Both Ladies look classy. Brigitte Marcron , I think classy Dior.